What kind of book would elicit praise from both Ed Stetzer of the Southern Baptist Covention's publishing arm Lifeway and Christian activist Shane Claiborne? If you were anticipating Jesus Manifesto as the answer, then you were right on the money. For that matter, Len Sweet and Frank Viola would seek like an odd pair to write a book together, and they actually acknowledge as much when they mention that there is much they disagree on when it comes to politics, theology and the like. But in the end, it is their love of Jesus and their deep desire that Christians embrace a Christ-centered life that brought them together and produced this wonderful book that seems to cross "party lines" and get down to the very heart of the matter when it comes to the Christian faith: Christ has died, Christ is Risen, Christ will come (is coming/has come) again. 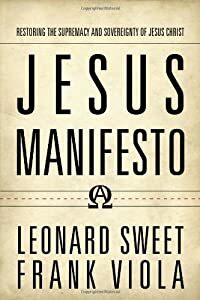 Jesus Manifesto is a devotional book of sorts. And by devotional book I mean the kind of devotional book that challenges you, makes you think, brings you to your knees and gives you hope and joy. Not exactly Our Daily Bread, in other words. And this isn't just for individuals---in fact I am fairly certain that Viola and Sweet means this to be read shared, discussed and prayed over in community because this book is as much for the Church as it is for the Christians who are part of it. I'm not sure which of the two wrote this, but I loved it: "Maybe enough 'battle fatigue' has set in that the body of Christ is finally at the place where it is less interested in fighting those who oppose it and more interested in nurturing the faith it believes in and lives by." I have to admit, it's lines that like that really hit me where I live and breathe. There is enough conviction to go around in Jesus Manifesto. If you are are on the evangelical/conservative side of Christianity there are gems like this: "Jesus did not come to make bad people good. He came to make dead people live." If you are on the progressive side of you get to hang on to this: "If we start with the social and political as our reference point, the 'social gospel' becomes very 'social' and very little 'gospel.' In truth there is no 'gospel' that is not a 'social gospel.'" This is one of those books that could be easily read by church leaders of different denominations who wish to be in conversation with one another about what it really matters in the Christian faith. It could be read by church leaders who would seek to find unity in their fractured churches and denominations. It could be read by pastors who have grown weary of books describing a "third" way forward through the theological morass we've created by focusing on everything other than Christ. And it could be read by individual Christians who have grown weary of a watered-down faith that is devoid of the very person it purports to revolve around. One of the lines in the closing moments of Jesus Manifesto truly sums up how far we've fallen in our faith and how far we need to go to return to an understanding that Christ is indeed the supreme and sovereign Lord for those who call themselves Christians. "It is Christ, not religion, that saves us." Man. I wish I'd written that. Anyway, I highly recommend this book. You can order it yourself by clicking on the link to the left.